John Wick is a fun, fast and furious revenge flick starring an on-form Keanu Reeves, featuring a ludicrous, so-bad-its-good storyline and epic action set pieces. The biggest crime is that it has taken almost six months for this high-octane neo-noir thriller to cross the Atlantic and reach our shores. 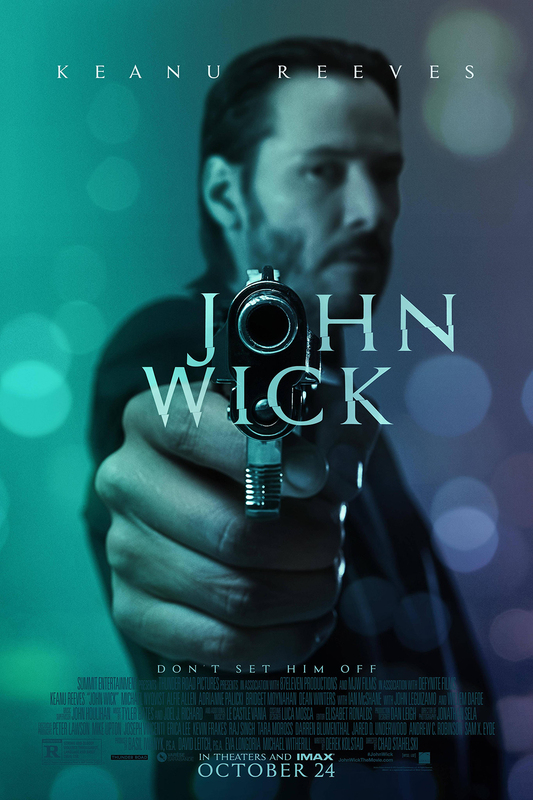 The eponymous John Wick is an ex-Russian mob hitman who must come out of retirement in order to seek vengeance for the death of his dog – a gift from his recently deceased wife. In order to do so, he must return to the unforgiving criminal underworld that he disavowed taking on all-comers, from rival assassins to psychotic criminal bosses. It sounds like an unbearable mish-mash of genre clichés and noir tropes, doesn’t it? It sounds like it should be unwatchable. It isn’t. John Wick keeps the viewer glued to the screen from the very first minute to the last. It’s the biggest and ballsiest blockbuster of a B-movie that you will ever, and it is glorious. John Wick is a movie in a hurry, from its epic action plot points (Keanu Reeves taking on faceless bad guys in his home, a seedy club, the mean streets of a neo-noir New York and pretty much anywhere else that takes his fancy) to the already established characters and lore. The criminal underworld that Wick returns to includes a hotel that exclusively caters to assassins where the only currency accepted is gold coin, and which boasts a concierge called Charon (the ferryman of Hades in Greek mythology). It’s all shot in a slick neo-noir style that brings out the best in the lavish action on offer. Everywhere Wick goes, he is recognised. This movie skips the backstory and heads straight to the long-awaited sequel. We don’t need to know how Wick became such a badass; the important thing is that he is, and breaking into his home, stealing his car and killing his dog was probably not the best move. After all, this is the same man that once killed three men with a pencil, as our psychotic villain of the piece Viggo Tarasov (Michael Nyqvist) memorably puts it in an early scene. There are also a number of other brilliant performances from the likes of Alfie Allen (playing our villain’s inept son), Willem Dafoe (a rival assassin with questionable loyalties) and Ian McShane (owner of the underworld hotel). The most important thing for a movie like John Wick is to sell the premise. If you buy the premise, you buy the bit. This film takes that and dials things up to 11. Yes, it’s silly and yes, it’s slick; but, above all, John Wick is barrels of fun.